Of course our taste buds change as we grow up and I absolutely love making these, this recipe is so simple and easy!!! So please “if you like coconut” make these, you will not be disappointed, I love having mine with a great cup of expresso…Enjoy!!! I like my coconut fine, so I add it to the food processor and pulse a few times to make the coconut finer, you do not have to do this, this is just how I like it. Attach the whip attachment to your mixer, in bowl add egg whites, cream of tartar and salt, beat until egg whites become white and just start to stiffen. Then add sugar in 2 parts, sprinkle in 2 1/2 tbsp. let that beat a few seconds then sprinkle in the remaining sugar and add vanilla, continue to whip until egg whites are very stiff. Fold in coconut, drop by the teaspoon or tablespoon (I do 2 tablespoon scoop), onto silpat or parchment lined baking sheet. Bake teaspoon size for 15 – 20 minutes, tablespoon size for 20 – 30 minutes, they should be golden brown but still moist inside. 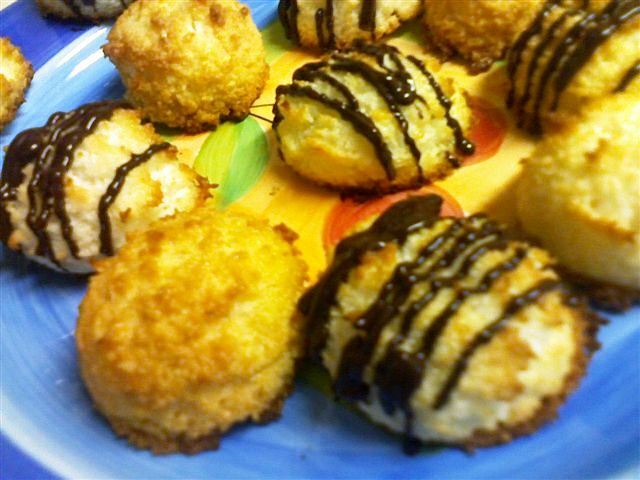 If you want to add chocolate, just melt chocolate and drizzle over top or dip half the macaroon into chocolate.